Soka Gakkai Luxembourg (SGI-LUX) consists of the Luxembourg membership of Soka Gakkai International (SGI). SGI is a Buddhist association with more than 12 million members in 190 countries and territories worldwide. For SGI members, Buddhism is a practical philosophy of individual empowerment and inner transformation that enables people to develop themselves and take responsibility for their lives. What is the philosophy of SGI? The core philosophy of the SGI can be summed up by the concept of "human revolution." This is the idea that the self-motivated inner change of a single individual positively affects the larger web of life and results in the rejuvenation of human society. The SGI movement has its roots in the life-affirming philosophy of Nichiren, a Buddhist monk who lived in 13th-century Japan. Nichiren felt passionately that Buddhism should enable people living in the real world and facing real problems to become empowered and change their lives for the better. Nichiren Buddhism stresses the profound connection between one's own happiness and the happiness of others. For SGI members, Buddhism is a practical philosophy aimed at awakening people to the limitless potential and value of their own lives. Practicing Buddhism brings about a positive transformation in the depths of an individual's life, transforming fear into courage, deluded impulses into wisdom and egotism into compassion. SGI is active as an NGO promoting peace, culture and education, in keeping with the Buddhist tenet of respect for the sanctity of life. SGI members work in ways appropriate to local culture to promote human rights and sustainable development, raising awareness and forging links at the grass-roots level to foster a culture of peace. SGI is a firm supporter of the United Nations, with liaison offices in both New York and Geneva. What is the practice of buddhism? 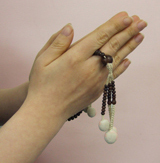 There are three basics in applying Buddhism: faith, practice and study. They are the primary ingredients in the recipe for developing our innate enlightened condition, or Buddhahood. All three are essential. With this recipe, we will experience actual proof of our transformation in the forms of both conspicuous and inconspicuous benefit. The recipe is universal. These basics are the same in every country where this Buddhism is practiced.